Mrs. Yuka layme is dedicated to bringing the VERY BEST in variety entertainment. Currently, she is producing the following unique and diverse shows, but check out her calendar to keep up to date on her individual performances. MRS. YUKA LAYME PRESENTS is a monthly drag variety show exclusively at the Panic Bar in Lincoln, NE. This isn't your standard drag show! The audience can expect a mix of lip sync performances peppers with live songs and some of the areas best variety performers & burlesque dancers. Each month is a different theme and cast. Mother knows best! 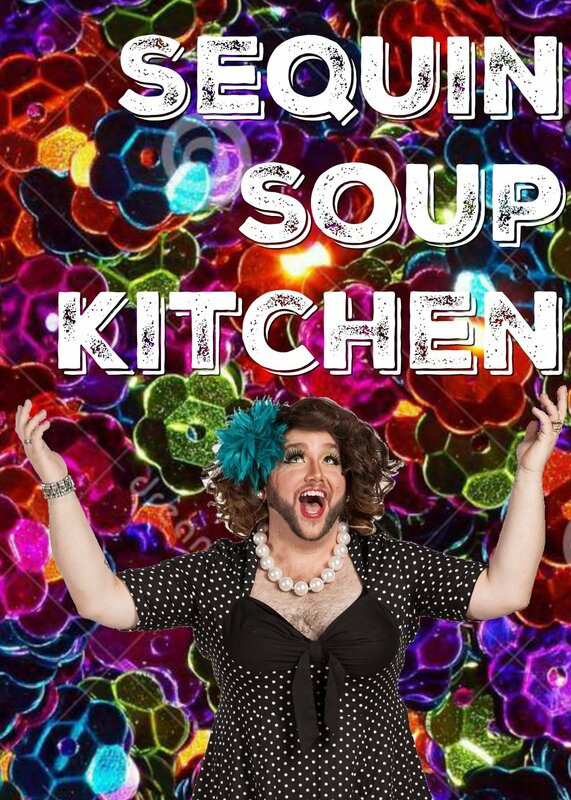 Join Mrs. Yuka Layme for a night of food and booze! Give a cougar a cooking show and she'll drink all of your booze! Mrs. Yuka Layme will entertain you while performing a delicious meal. learn how to make a new dish (or two) and be entertained by her Sous Chef(s). Sample her scrumptious creations and take home a recipe for your own culinary adventures. Dinner is best served with sass, class, and a wine glass. A "drop in performance" night. Are YOU the one Mrs. Yuka Layme is looking for? Have you wanted to try drag? Are you a singer or musician looking for performance opportunities? Do you have a variety act that needs to be seen by the public? are you a PRO, but want a safe space to try out new material? Mrs. Yuka Layme is a QUEEN SEEKING...you. Adding a little pizzazz and sparkle to afternoon's favorite past time...STORY TIME! Join a very special story time presented by your favorite local drag queens. These events are a way to bring children, families and Drag Queens together for a playful hour of celebration and fun. Drag Queen Story Hour: Nebraska is presented by drag/cabaret performer Mrs. Yuka Layme with generous help from OUTLINC and Starbucks. She's not just all about entertainment! Mrs. Yuka Layme is available for your wedding needs! 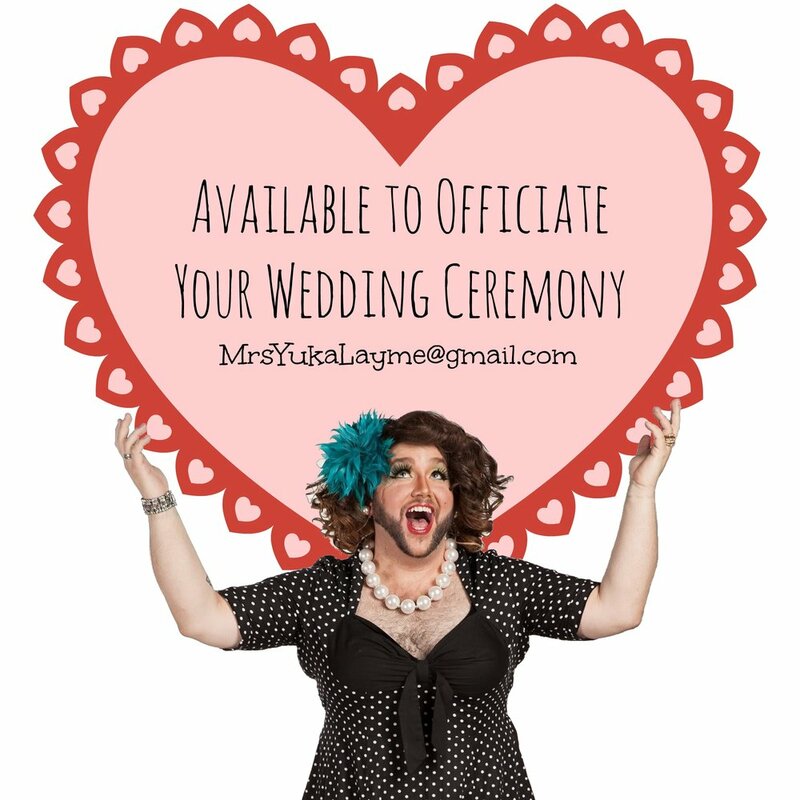 She is a licensed officiant and help give your ceremony some pizazz. Do you need help writing your non-religious ceremony? She can help you there as well! PS: Non-Drag option also avilalbe. Mrs. Yuka Layme uses the aid of her gal pal Amanda Lynn to help give you the basics of Drag & Beauty makeup. These can be tailored to your specific needs and completed in a safe and fun environment. Mrs. Yuka Layme would love to EMCEE or HOST your event! She is a well spoken and entertaining host who is appropiate for all ages. She is adaptable to whatever audience is in front of her and will work with you to make your event the highlight of the year. References upon request.